One of the most popular categories of online video is how-to. TubeMogul released research in July 2008 that showed how-to videos ranked eighth in terms of views, ahead of news and blogs and one spot behind sports. Of course, the majority of all videos watched - including how-to - will take place on YouTube. But it's not the only place. In fact, there are several other sites worth your attention, and gaining attention among users. It's difficult to think of any business that could not produce and market a how-to video. Just about every product could use a demonstration - whether showing how it works, explaining alternative uses for a product, or simply showing it off from different angles. A local plumber could show how to fix a simple leak, a guitar shop could offer a free lesson online or a travel agent could show how to efficiently pack a suitcase, for example. If you think about your business offerings, you'll find something worth a how-to video. So start shooting, then distribute your video. To peer into the consumer mind, we did a simple Google search for "how to video" and "how-to videos." As consumers usually pick one of the first few results, we plugged those sites into Compete.com to give you a view of the traffic numbers and trends. eHow is far and away the leader out of our results, with nearly 13.5 million unique visitors per month, good for a 200% increase from last year. Below is Compete data for five other how-to video sites, WonderHowTo.com, ExpertVillage.com, 5min.com, MonkeySee.com and Howcast.com. 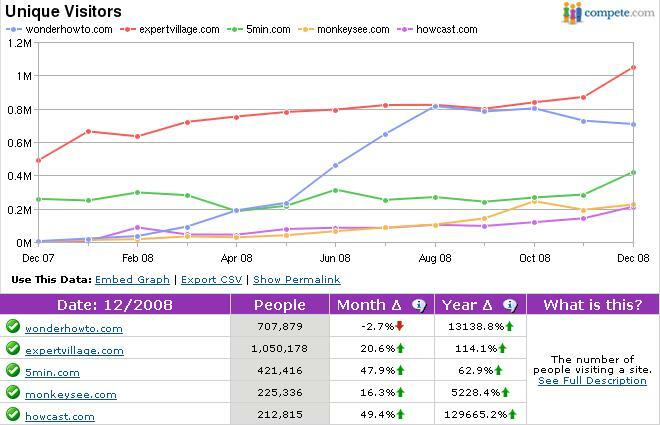 As you can see, ExpertVillage is leading the way, but WonderHowTo is closing in. Some of these sites are pretty new, so the numbers may appear a bit distorted. Nonetheless, it's clear that how-to video in general is gaining popularity with consumers.